When it comes to smartphone manufacturers, right now there are really only two companies that really matter – Apple and Samsung. Not only do they both have the most marketshare, but they’re making a ton of profit. In fact, they’re making so much money that the two companies combined account for 103% of the total cellphone profits of 2012. Wait, isn’t it impossible to account for 103% of the profit? Well, no. Because operators like BlackBerry, Motorola, and Nokia operated at a loss last year, Apple and Samsung were able to make more than 100% of the profit, which is pretty insane. While Samsung is leading in marketshare, they only took home 34% of the profits from the cellphone industry. Apple on the other hand has lower marketshare than Samsung, but double the profits with 69%, according to Cannacord Genuity’s estimates. 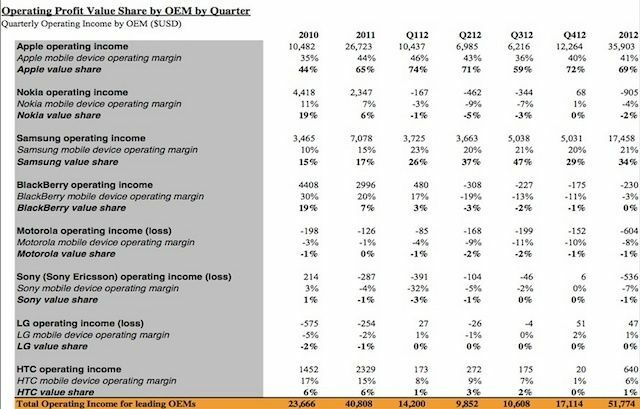 With the help of the iPhone 5 launch, Apple had it’s most profitable fiscal quarter ever in Q1 2013. Samsung is looking to answer the iPhone 5 with the launch of the Galaxy S IV that might make its debut this March.